Everyone knows about the magnificent waterfalls that give the Niagara region its name and fame. However, not many people know about the large, natural islands that emerge around the swirling, thundering waters of the Niagara River. On your next stay in Niagara Falls, consider exploring either of the following beautiful islands to learn a little more about Niagara history and ecology. The largest, and most memorable, island in the Niagara River is Goat Island, which works to separate the large, Canadian Horseshoe Falls from the smaller American Falls and Bridal Veil Falls. In the late 18th century, the Seneca, an American Indian group, signed a large portion of land in the Niagara region to the British in reparations for their historical attacks on British traders. One of the victimized traders, John Stedman, claimed an island as his rightful property from the treaty, and he used the land to raise goats. Though the goats died in a particularly harsh winter not long after Stedman assumed the land, the name of the island stuck: Goat Island. Even after New York gained control of the island — and attempted to rename it Iris Island after the Greek goddess of rainbows — locals refused to call it anything but Goat Island. As Niagara Falls became more popular among tourists, many entrepreneurs imagined Goat Island as an extension of the bustling tourist district. Vanderbilt, the railroad titan, imagined the island as a smaller, more elite attractions space, filled with hotels, shopping, and restaurants. Conversely, P.T. Barnum of circus fame fought heavily to make Goat Island one of the country’s largest circus grounds. Today, Goat Island is legally owned by the State of New York, and it is registered as a part of the Niagara State Parks system. Because the island is open to visitors but bereft of inhabitants, the flora and fauna indigenous to the region have flourished. Situated between the two groups of Falls, Goat Island offers some unique views of the region; you absolutely cannot miss Terrapin Point, which offers a grand look at the Niagara landscape of New York. You can reach Goat Island via a variety of routes: a foot path, road, and trackless train all cross the thundering Niagara River to deliver visitors to the beautiful island. A smaller spot of land to the north of Goat Island, Luna Island separates the American Falls from the Bridal Veil Falls. While this location is often overshadowed the grandeur of its larger neighbor, Luna Island has plenty to offer intrepid travelers looking for exceptional views. Initially called Prospect Island due to the land’s superior views over much of the Niagara region, the island soon became famous for the inimitable moonscapes visible from its lookouts. 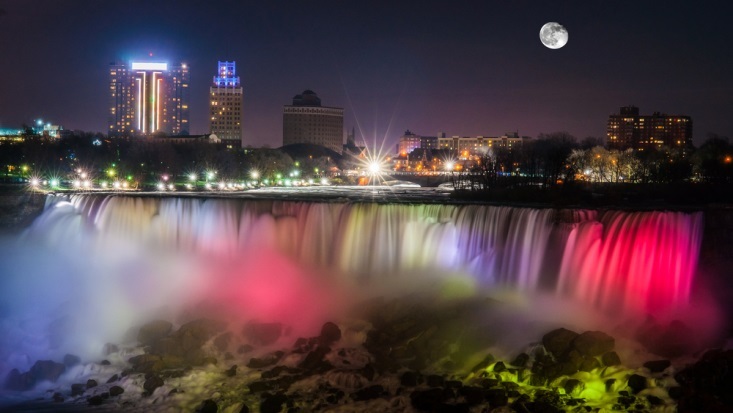 On bright moonlit nights, many a face turned skyward on Luna Island could see magnificent lunar rainbows through the Falls’ mists. Today, the magnificent fireworks shows and the nightly illumination of the waterfalls and surrounding landscape make moon bows a rare sight — but dedicated visitors may still perceive a dash of color in the night sky. Tourists can reach Luna Island by traveling to and through Goat Island. Though Luna Island isn’t large enough to warrant a vehicle path, pedestrians may cross a walking bridge to see Niagara from this picturesque space.